Norman Rockwell's Portrait of Richard M. Nixon appeared on the cover of The Saturday Evening Post published November 5, 1960. This painting was Rockwell's 313rd overall of 322 total pictures featured on the cover of The Post. Rockwell's career with the Post spanned 47 years, from his first cover illustration, Boy With Baby Carriage in 1916 to his last, Portrait of John F. Kennedy, in 1963. This is also the sixth for The Post in 1960. In 1960, there were six Norman Rockwell Saturday Evening Post covers published. The original oil on canvas painting is part of a private collection.. This painting also appears in three Rockwell commentary books. It appears on page 132 of Norman Rockwell: A Sixty Year Retrospective by Thomas Buechner, as illustrations 490 and 571 of Norman Rockwell: Artist and Illustrator by Thomas Buechner and on page 229 of Norman Rockwell, A Definitive Catalogue by Laurie Norton Moffatt. Some of the photographs used in painting this portrait are reproduced in Norman Rockwell: Behind the Camera by Ron Schick on page 198, as well as the painting itself. This classic Norman Rockwell painting was first published as the second installment of a prevew to the 1960 US Presidentail election. The US Presidential electoral contest in 1960 was largely bettween the two candidates of the two major parties, Republican Richard Milhous Nixon and Democrat John Fitzgerald Kennedy. 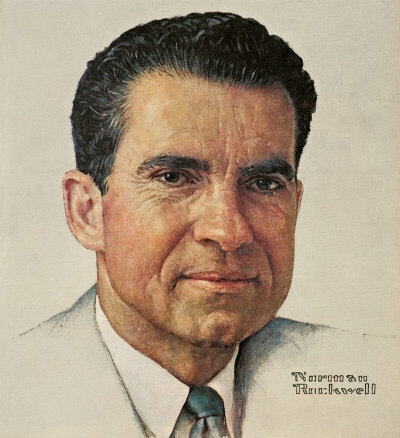 Portrait of Richard M. Nixon was only one of 322 Norman Rockwell Saturday Evening Post covers; Here is the list of Norman Rockwell Saturday Evening Post cover illustrations. Nixon was the sitting Vice-President under President Dwight D. Eisenhower, and Kennedy was then a young Senator from Massachusetts. Portrait of John F. Kennedyt was published ten days before the election, and Portrait of Richard M. Nixon was published the next Saturday, three days before the election. The Post had commissioned Norman Rockwell to paint portraits of the candidates as part of its election coverage. The election ended up being a close one. Kennedy garnered only 0.2% more votes Than Nixon. John F. Kennedy became the 35th President of the United States when he took his oath of office on January 20, 1961. Richard Nixon later went on to enjoy a successful political career. Nixon declared his candidacy for the office of President in the 1968 election. His opponent in that election was Hubert H. Humphrey. He was elected President of the United States on November 5, 1968 and inaugurated January 20, 1969. Norman Rockwell also painted another portrait of Nixon. That painting was published in the February 4, 1969 edition of Look magazine, on pages 25 to 26. That portrait is currently housed and on display at the Smithsonian's National Portrait Gallery in Washington, DC. Nixon was re-elected by a landslide in the 1972 Presidential election. His opponent in that contest was Senator George McGovern. He resigned August 9, 1974 amid controversy.